HELP ! - IT WON'T START ! This guide can be used for just about any vintage internal combustion engine. Even a perfectly-maintained tractor can break. Rarely have I seen a perfectly-maintined tractor. I like to think mine are better than average, but when other projects jump to the top of the list, maintenance always takes a back seat. Cold Weather Starting - When the temperature drops below freezing, do your tractor a favor, and slap a magnetic heater on the oil pan about 30 minutes before trying to start it. Grinding the starter until it finally catches is bad. An even worse habit is giving it a shot of starter fluid. I've never had a can of the stuff and never felt it was necessary. Modern cars have computers. When we plop in the seat and go to start them we have become accustomed to the few seconds it takes for the computer to wake up and send sparks to the engine (Yata, yata, yata, yata, Vrooom). Vintage gas engines don't have computers. They are always ready to go when the first cylinder makes compression and gets a spark (Ya Vrooom). When my tractors are tuned right, the engine is running before the start button has been pressed all the way down. If it takes nore than a second or two of cranking to start the engine, that tractor is behind on maintenance and becoming hard to start. It will probably continue to start and run ok for several months without doing any work on it, but the list of things that need attention is growing all the time. Vintage engines need a lot of work to the air, fuel, and ignition systems to keep them running right. Most of that work is just cleaning, polishing, and adjusting so it isn't expensive unless you have to pay someone else to do it. If that is the case, you should not have bought anything with a vintage gas engine. GULP! Where do we begin? Just at a glance I see four things that shouldn't be that way. The list soon gets so long I can't look anymore. The only way I'm working on this is if they will sell it to me so I can start fixing years of neglect. The answer is very simple, three years with no work needed is baloney. Vintage gas engines ALWAYS need work. My usual reply is that there is never just one problem that prevents an engine from starting. The response often comes back something like, "I've already replaced the points, condenser, coil, cap, rotor, spark plugs, and..... what else could it be?" Replacing random parts always creates new problems. When I go to the doctor with a cough, I hope they spend some time diagnosing the problem before deciding to replace hips, knees, yank my appendix, and put in a pacemaker. Maybe some of those things need replacing, but I want them to focus on the immediate concern so I don't cough up a lung on my way home. The things that cause these engines to be slow to start do not require replacing anything. New parts are not guarenteed to be good parts. If the engine was running recently, it will run again without replacing any parts. Once the engine is running again, replace parts one at a time, so if a new part is bad, we know what we just messed with and can put it back the way it was. These engines are really very simple. An engineering degree is not required. They only need three things to run: COMPRESSION, FUEL, and SPARK (at the correct time). The engine should fire right up unless flooded. When that happens, I can smell it, and I know exactly what I did to cause the problem. Too much choke is a very common problem with these engines. They are very easy to flood. Let go of the choke knob, open the throttle, and see if it will fire, and clear the plugs. If you are using Autolite 437 plugs, it should clean up and start running right. If you are using any other plug, it may not even fire unless you put in a clean, dry set of plugs. Before we get into step-by-step trouble shooting, it's important to have a basic understanding of how the engine works. Hopefully the compression check is good, because without that we are done before we start. Even without a genuine compression gauge, we can get a good idea that an engine has decent compression just by trying to turn it by hand. Grab the fan belt and pull. The engine should turn fairly easy until one of the pistons starts to move up with the valves closed. Even better, just pay attention to how the engine cranks with the plugs out, then with the plugs in. Big difference = Good. Little Difference = Bad. The engine compression checks are the best way to discover major engine problems, and get an idea of overall engine condition. If the compression is very low, all the things we might do to try and get the engine to run are a complete waste of time. All compression checks are done with all the spark plugs removed and a fully-charged battery. Zero the compression gauge and put it on one spark plug hole. Crank the engine over with the starter. The cylinder you are checking should go through 3 or 4 compression cycles. The compression gauge will remain on the highest value. Write that down, zero the gauge, and do the next cylinder. Once you have the dry numbers for each cylinder, pour a little motor oil in each cylinder. Crank the engine a few times to circulate the oil. Do the compression check again for each cylinder and write down these "wet" numbers. What we are looking for is "dry" compresion numbers of at least 90 PSI. "Wet" compression values that are much higher than the dry numbers indicates worn and scratched cylinders, possibly broken rings. If this engine was frozen and just broken loose, that may have snapped a ring or two. One or two cylinders with dry and wet compression much lower than other cylinders can be caused by stuck or burned valves, blown head gasket, or cracked head. Stuck valves can be un-stuck by removing the valve covers. Look for valves that don't follow the lifter back down. There's the problem. Soaking in ATF, and maybe a little PB Blaster may help unstick them by hand. Valves may need to be unstuck a few times before the solvent takes care of the problem. If the tractor has been converted to 12 volts, it will crank faster, and the compression will be higher. This can allow an old tired engine to continue in service longer. A worn out engine will only continue to have less power, and be harder to start. My tips on engine rebuilding can be found here Engine Rebuilding. Fuel needs to travel from the fuel tank, down the fuel line to the carburetor, where it will be vaporized and drawn into the cylinders of the engine through the manifold and intake valves. Ok, that might be getting a bit too technical. Start with the simple stuff. Is there fuel in the fuel tank? Is the fuel more than a year old? Is the tank reasonably clean, or full of trash and sludge? Is the tank vent open? Is the fuel shutoff valve open? Are the fuel screens clean? Is the fuel line reasonably straight and not kinked? 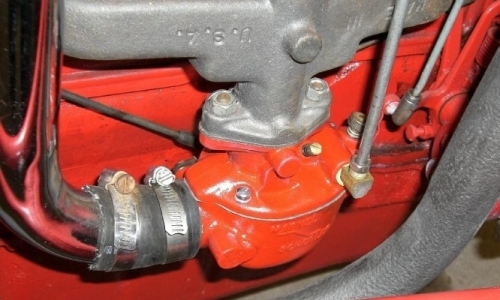 Is the carburetor bowl filling with fuel? That may seem like a lot to check, but one simple test will verify if all that "stuff" is ok. Find a clean can (about a quart size, with a large opening). Remove the bolt from the bottom of the carb. This is the carb drain plug. Fuel will come out. Open the fuel valve two full turns, and watch the fuel flow. There should be a steady stream of fuel. If not, the fun begins. Servicing the fuel system is just taking apart and cleaning everything from the tank to the carb. Please refer to my complete Fuel System tune up page - Click Here. 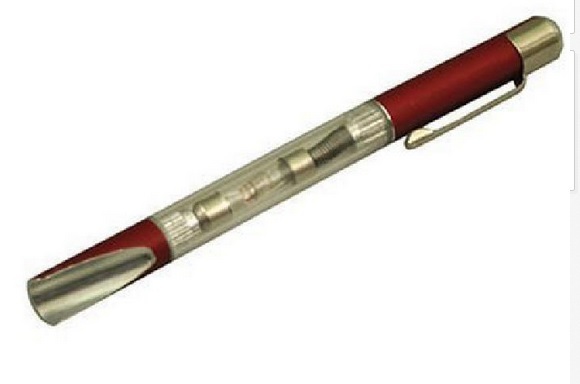 The Spark or Ignition System is easily checked by simply pulling a plug wire loose from the spark plug, and holding the metal end about 1/4" away from the metal engine block. Don't worry about paint. The high voltage spark will jump right through the paint to the metal. 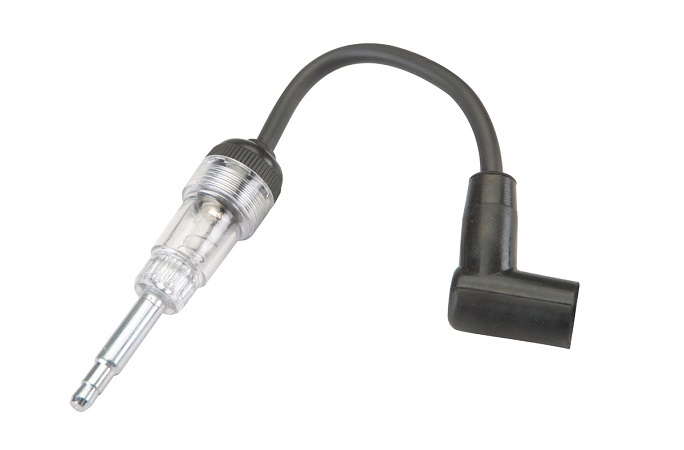 If your spark plug wires are the original type with no rubber boots, this test might require absorbing more high voltage than you are comfortable with. If you choose not to test your personal tolerance for high voltage, try pulling one of the wires at the distributor, shove the boot up the wire and get the spark to jump out of the distributor terminal post. What we like to see is a nice Crackling-Blue spark that will easily jump 1/4" or more. If you see nothing, or a weak-whimpy yellow spark, we have ignition problems. Please refer to my complete Ignition System tune up page - Click Here. There are several types of spark-checking tools that can be used if you prefer not to handle ignition wires with the engine running. Just make sure the tester has an angled boot or clip that will fit between the spark plugs and gas tank on these engines. Let's assume your tractor has been running ok and suddenly just won't start. This step-by-step troubleshooting procedure is listed with the easiest, least expensive, most likely items first. If the engine won't even crank, Click Here. Did you forget to turn the ignition on? These engines crank when the start button is pressed, even with the ignition turned off. Go ahead and laugh, I've flooded mine many times cranking with the key off. There were times I couldn't remember which way to turn the key for ON. It got so bad I added an ignition ON light to all my tractors. Problem Solved. Check for spark using one of the testers above, or simply pull one plug wire off and hold the end near any part of the block. A good hot blue spark will jump at least 1/4". Weak yellow or intermittent sparks indicates a problem with voltage or something in the distributor. Water in Distributor - Does this no-start happen when the tractor get's wet. Rain, dew, or melting snow could be getting inside the distributor. Remove cap, dry out any signs of moisture. On a front distributor engine, check the gaskets and replace if necessary. Check Ignition Circuit - Use a voltmeter to check votage at battery, both sides of key switch, resistor, coil and distributor. Verify connections to points, and condenser are good and nothing is grounded. If this circuit is grounded or open at any point it will not work. Especially look at any flexible copper strips to the points. Other problem areas are where the coil wire passes through the side distributor body, and the front distributor coiled springy terminal connection to the points. Try "hot-wiring" the tractor with a wire directly from the ungrounded battery terminal to the coil. If it starts that way, the problem is somewhere in the ignition circuit. Jumper individual parts and wiring to find the problem. Don't start fiddling with the carb! The Carb is always the LEAST LIKELY source of trouble. One of the first hard lessons I learned is that almost EVERYBODY starts fiddling with the carb when they are looking for a problem, but 99 percent of the time, the problem is somewhere else. All we are doing is CREATING more problems by fiddling with the carb. Think about it a second. What are the chances that the carb has all of a sudden become misadjusted? All those little spring-loaded adjusting screws just started re-adjusting themselves, right? We often use those adjustments to make our engine run better, because it is easier to turn an adjusting screw than anything else. These adjustments can compensate for and mask other problems, but when we are eventually forced to find and fix the real problem, we will now have to readjust the carb. This is at least twice as much work as staying on top of the regular maintenance. Always start by looking for and fixing the most likely problems like fuel supply, clogged filters, corroded connections, burnt points, fouled plugs, etc. If you smell gas, and it won't fire, remove the spark plugs, and replace with a fresh set. If they are fairly new, and just wet, you can dry them with a propane torch. Just cook off the moisture, and check the gap, we are not trying to melt them down. Are these Autolite 437 plugs? Most owners of these tractors are using Autolite 437 plugs. They run a little hotter and stay cleaner than the originally recommended Champion H-10 plugs. I have been using the Autolight 437 plugs and have almost never had to remove and dry them off to get my tractor started, even when flooded. 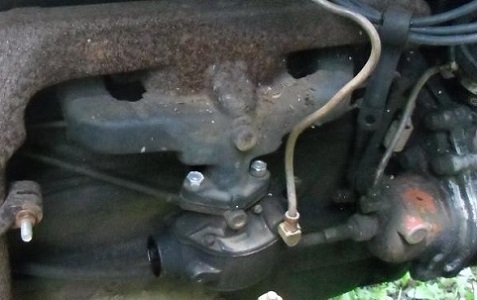 Try stepping on the clutch, even with the transmission in neutral, stepping on the clutch removes a lot of rotating parts, so the engine should turn over a little easier. Bad Gas - Look at the fuel in the glass fuel bowl. Do you see dirt, or anything that looks like water bubbles? If the tank is less than half full, but looks clean, fill the tank with fresh fuel, then drain-off a little through the carb. Close the fuel valve, remove and clean the glass bowl. Clean or replace fuel screens. Water in the fuel could just be from condensation. If fuel is very old, looks or smells bad, drain the tank and fill with fresh fuel. A vintage gas engine will tell us when something is going bad. If your tractor starts, but still has problems, here are the most common symptoms and solutions. The time indicated for each of these is not an exact measurement. This is intended to show that some problems take longer to develop or return to normal so that information can help identify problems. Runs rough, skips, misses on random cylinders. Points quickly become burned and pitted. = Replace condenser. Runs for about 3-minutes and quits; will not restart = GAS TURNED OFF (go ahead and laugh, I've done it, more than once). Runs for about 5-minutes and quits; restarts in about 10-minutes = CLOGGED FUEL SCREEN. Fuel trickles but won't flow. Runs for about 15-minutes and quits; restarts after about 30-minutes cooldown = BAD IGNITION SWITCH. Install jumper around switch and start engine to test. If problem goes away, replace ignition switch. Do not leave that jumper connected, or ignition key ON, with the engine stopped = Fried Points and Coil. Runs for about 30-minutes and quits or starts running rough; but after 1-hour cool down, engine restarts and runs fine = BAD IGNITION COIL, replace ignition coil. Tractor is flooded, gas leaking out of carb. 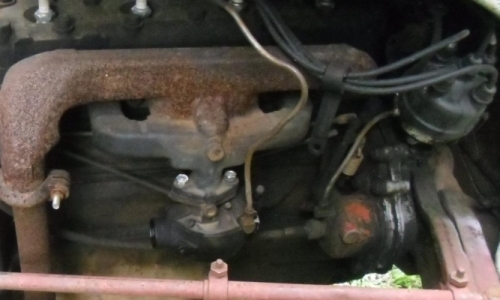 Float valve in carb may be stuck (whack side of carb with a wooden hammer or screwdriver handle). A carb rebuld may be needed if this isn't a one-time thing. Leaking or cracked manifold, Bad or Broken plug wires, Incorrect firing order (should be 1243 front to back). Even if the intake tube isn't missing, maybe the carb is just as dirty on the inside? I keep a couple rebuilt carbs around. Swapping carbs only takes 30 minutes or so. That's a lot less time than doing a rebuild when I need the tractor for something. A fresh carb solved the problem. Sometimes it is the carb. Could the old carb have been adjusted? Maybe, but I've found any clean carb starts and runs much better than a dirty one. The 8N is back to starting almost as soon as I touch the button. Since I recently rebuilt the dirty carb, I know all it needs is a good cleaning and gaskets. No need to fork out cash for a rebuild kit.